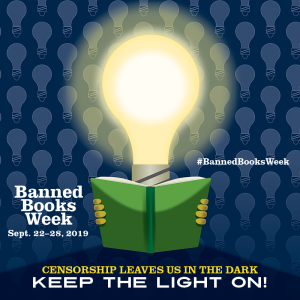 Banned Books Week 2018 Calls Out Censorship! Banned Books Week 2018, the annual celebration of the freedom to read, will be held September 23 – 29. The 2018 theme, “Banning Books Silences Stories,” is a reminder that everyone needs to speak out against the tide of censorship. As we kicked off National Library Week, the American Library Association’s Office for Intellectual Freedomreleased their list of the Top 10 Challenged Books of 2017. The list includes the critically acclaimed and timely YA novel The Hate U Give by Angie Thomas, the bestselling middle grades graphic novel Drama by Raina Telgemeier, the groundbreaking children’s book And Tango Makes Threeby Peter Parnell, Justin Richardson, and Henry Cole, and much more. These stories and others have been silenced, and Banned Books Week is a call to action to speak up for the right to read. Where can I find a list of the 2018 Banned Books? Hi Sharon. The American Library Association doesn’t release the top ten challenged books for 2018 until after the year is over. We will publish it in April 2019.